Join Eventmasters for one of the most talked about social events of the racing calendar. 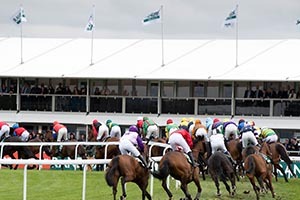 Adding a touch of eminence to the prestigious Grand National at Aintree Racecourse, Ladies Day is an occasion oozing class, style, and above all top-drawer horse racing. We have put together a guide for all things Ladies Day at Aintree. Aintree Ladies Day is arguably one of the most fashionable events in the sporting calendar. Style is at the forefront of the day with the best dressed winning Aintree’s coveted Style Award. Prizes in 2018 included a Range Rover Evoke. Day two of the Grand National festival allows ladies to reach their full fashion potential. Popular trends at the event include neutral shades, florals and huge fascinators. Aintree Ladies Day puts a modern twist on the traditional dressing up for the races trend. The fashion statement of the event is certainly the distinctive hats. Whether it be small and discreet, or large and vibrant you are certain to make a fashion statement. Many ladies opt for a bespoke option to make their outfit that little more special. There is no official dress code, however smart wear is preferred and no sportswear or fancy dress. In hope of avoiding a fashion faux pas, it is important to plan ahead. Don’t leave the dreaded outfit shopping until last minute. Most importantly, wear something you feel both comfortable and confident in. Ignore the weather for one day only, let your hair down and enjoy ladies day in your best outfit. The glitz and glam doesn’t take away from the high class racing the day presents. Four grade one races are hosted on day 2, making this race day experience unforgettable. The first of the grade one races is The Crabbie’s Top Novices’ Hurdle. 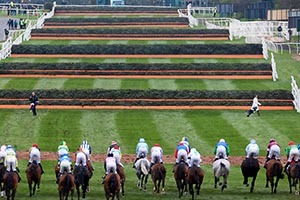 This race sees horses over the age of four jumping over a total of 9 hurdles in a bid to be victorious. The second race of the day is the Mildmay Novices’ Chase. With nineteen hurdles and 3 miles of racecourse, this makes for an exciting race. The first race was in 1981 and the first winners were Bregawn and Burrough Hill Lad. The JLT Melling Steeple Chase is the third race of the day and is the one with the biggest prize. Named after Melling Road, the race has sustained its place in history since 1991. Closing Ladies Day racing is Sefton Novices’ Hurdle race. The distance is around 3 miles making it a fair stretch for novice runners. Open to horses over 4 years old, the race has retained its Grade 1 title since 1993. There are a further three races throughout the day, ensuring you get a good racing fix. The gates open on Ladies Day at 10:00, with races starting around 13:45. Dress smartly, think sophistication and glam. Style ambassadors will be on the lookout for the best dressed for the Aintree Style Awards. You can enjoy a VIP Ladies Day experience like no other with Eventmasters. If you’re looking to enjoy Ladies Day in sublime style, then look no further than Eventmasters corporate hospitality. Experience Grand National Ladies Day in true style with our VIP hospitality packages and tickets.